engraving on the metal brings out the texture of the panther's coat. This ring is a panther, set with small, pear-shaped emeralds for eyes. Flashing a brilliant green as they are viewed from different angles, they give the impression that the panther is sitting cautiously aware, facing an opponent. When this ring is placed on a finger, it is as if the tiny animal has taken to you, which makes it all the more charming. The neck can be angled twenty to thirty degrees, allowing the ring to be enjoyed in a variety of positions, such as a peacefully sitting pose or one where it appears ready to pounce. The small diamonds in this ring are pavé set, while engraving on the metal brings out the texture of the panther’s coat. The back of the ring is open, finished in a four- and five- sided pattern to allow maximum light to enter the diamonds, and black onyx is set in various places to create the spotted pattern. The muscles on the panther’s back are flexed in a strong pose that adds volume to the ring, and the solid construction of the pivot that the neck turns on is clearly visible from the back of the ring. Black onyx was used as an accent stone in many ornaments and pieces of jewelry during the Art Deco period (1920-1935). As a component, black onyx is an inexpensive yet very appealing material, capable of bringing out effects that cannot be expressed with platinum and diamonds alone. In 1914, Cartier was the first to use small pieces of black onyx as accents with pavé-set diamonds in a watch. Since then, this stone has been set in the bodies of panthers, as shown in the photograph to the next page, creating a style that is unique to Cartier. The “Panthére” necklace shown below is an abstract form of this motif, emphasizing the spotted pattern of the panther’s coat. 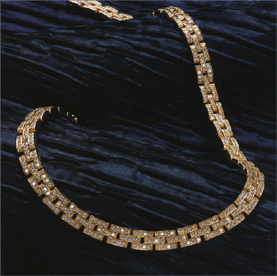 Four diamonds are securely bead-set in each of the slightly arched sections of the necklace. The sections are joined together with thick round pins, and durability is well considered. Although the piece gives an impression of weight, this is a basic necklace style that wears very comfortably.